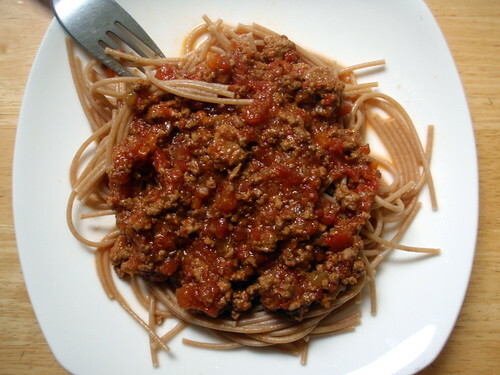 A few weeks ago I had eaten some pasta with bolognese sauce at Basta Pasta in Cambridge, and afterwards, I was totally craving more of the savory meat sauce. I remembered that The Kitchen had posted a recipe for making it using a slow cooker which sounded perfect, since I didn't really want to have to deal with hours in front of a hot stove during the summertime. Even so, you do need to spend some time sweating the vegetables, browning the meat, and reducing the liquids, but the end result is so totally worth it. The only changes I made to the original recipe is that instead of adding 1 cup of the reserved tomato juices, I reduced all the tomato juice from the 2 cans until there was only about 1 cup of liquid left and added that to the slow cooker. Also, I used a pound of ground beef and a pound of ground pork instead just ground beef. Heat the olive oil in a large saucepan over medium heat. 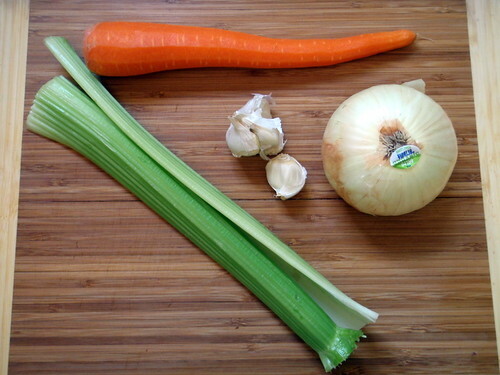 Add the onion, celery, and carrot and cook until the onion is translucent and all the vegetables have softened. Add the garlic and cook until fragrant, about 30 seconds. 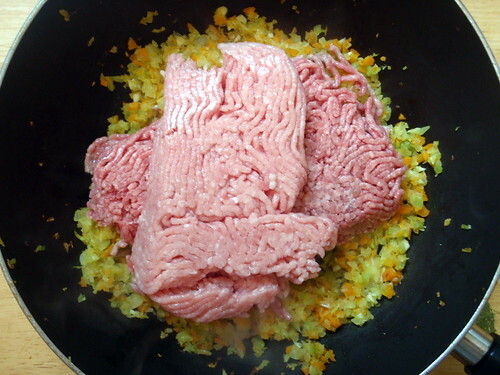 Add the pork and beef, breaking it apart with your spoon and cooking until it is just browned. Season with nutmeg, salt, and pepper. Stir in the milk and bring it to a rapid simmer. Continue simmering until the milk has reduced completely and very little liquid remains, about 10 minutes. Stir in the wine and simmer again until reduced completely, about 10 minutes. Transfer the beef mixture to the slow cooker. In the same, now-empty pot, reduce the reserved tomato juices until you have about 1 cup left. 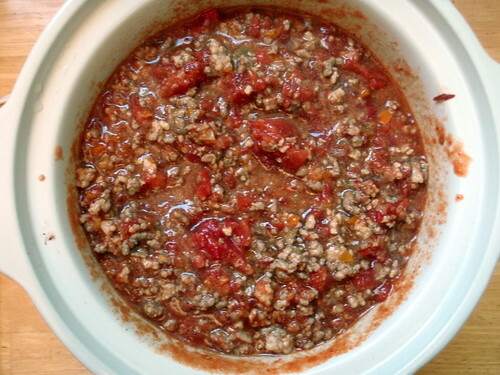 Add the chopped tomatoes and reduced tomato juices to the slow cooker. Stir to combine. Cover and cook on HIGH for 6 hours or LOW for 8 hours. 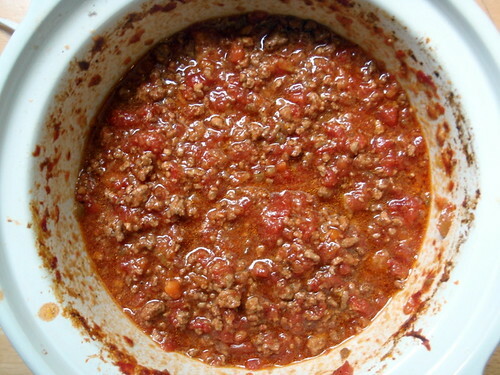 In the last half hour of cooking, remove the lid to allow any excess liquid to evaporate and reduce the sauce. The finished sauce should be chunky and creamy without being soupy. 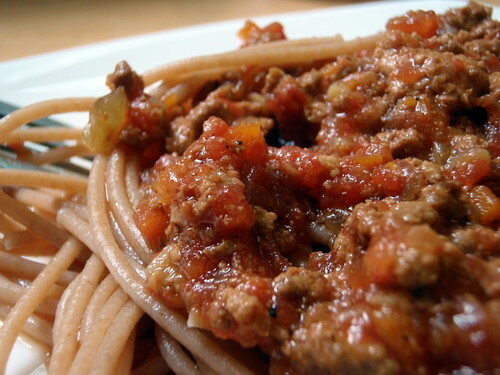 Serve over spaghetti with a hunk of crusty bread for mopping up the sauce! Every once in a while I'll scan Craigslist to see if anyone's selling an ice cream maker with its own compressor. They're usually several hundred dollars, so it's something that would be nice to have, but definitely not necessary, especially since I have such a reliable Cuisinart ICE-20. But a couple of weeks ago, I found one being sold for only $80. I was a little suspicious so I asked the seller why he was selling it, and he said that he was getting married, and his wife-to-be wanted him to get rid of stuff. Well, I was more than happy to help him out. It was a nice surprise when he included four ice cream sundae glasses, an ice cream scoop, and two ice cream recipe books with it as well! 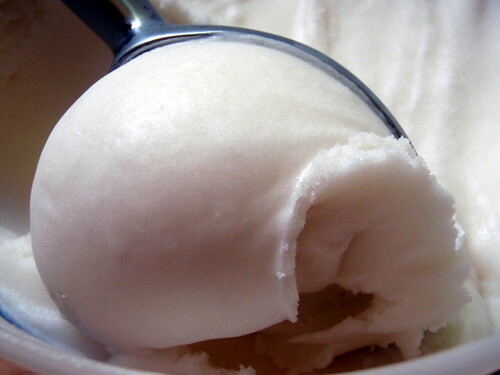 One recipe I really wanted to try out in my new ice cream maker was this one for coconut lime sorbet. 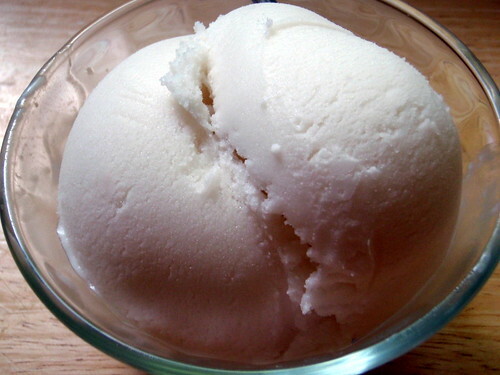 It's definitely one of my all-time favorite ice creams to make, and even won the ice cream thrown down I participated in a couple of years ago. But it doesn't always freeze well. There's definitely been a couple of times when the Cuisinart canister started melting before the sorbet was done churning. So I knew that it would be a good way to test how well the Lello ice cream maker worked. In a bowl whisk together ingredients. 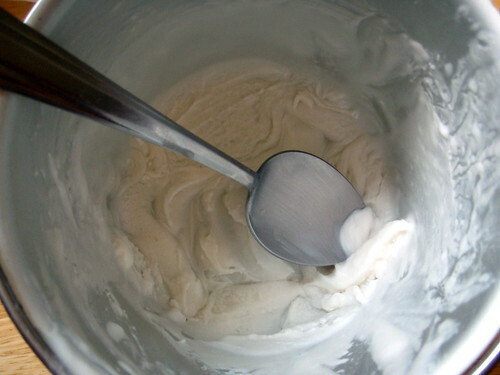 Freeze mixture in an ice-cream maker. Transfer sorbet to an airtight container and put in freezer to harden. I love the fact that there are only three ingredients for this sorbet; two, if you don't count the water. Also, you don't need to heat or chill the base before freezing. In fact, you shouldn't chill the base because then the coconut fat would solidify out of the mixture. What I think is kind of interesting is that it does harden when you're churning it, but since it's dissipated throughout the sorbet, it almost forms chips of coconut fat, adding a little bit of texture. I think it's almost a misnomer to label this treat a sorbet because, even though it doesn't contain any dairy, it's so super rich! The sweetness from the cream of coconut and the tartness from the fresh lime juice is also really intense. I've used bottled lime juice before in a pinch when I didn't have any fresh limes, and it tasted just as good. I would definitely NOT substitute coconut milk for the cream of coconut, though. Cream of coconut is a lot sweeter and fattier than coconut milk; if you use coconut milk instead it just won't have the right amount of sweetness or texture. Trust me on this one. One last thing, just as this sorbet doesn't freeze well, it also melts rather quickly, so make sure you take it out only right before you want to serve it.